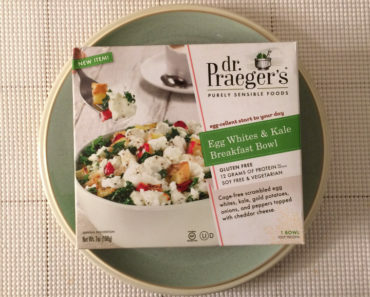 “Surf’s up!” claims the package for the Dr. Praeger’s Fish Taco Bites. We decided to check them out on a cold winter evening to see if these could truly conjure up tropical imagery in our imaginations. We could certainly use some of that here in Minnesota! You can cook these in a skillet, an oven, or a toaster oven. We went with the oven for our fish bites. (If you want to see all of the cooking instructions, check out our package scans at the bottom of this review). 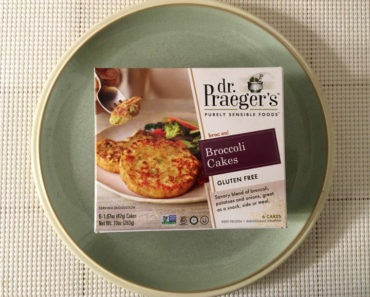 We mentioned in a previous review that we’re a bit surprised at how long Dr. Praeger’s fish bites take to cook. While we’re less surprised this time, we do still feel like these take longer than it seems like they should. 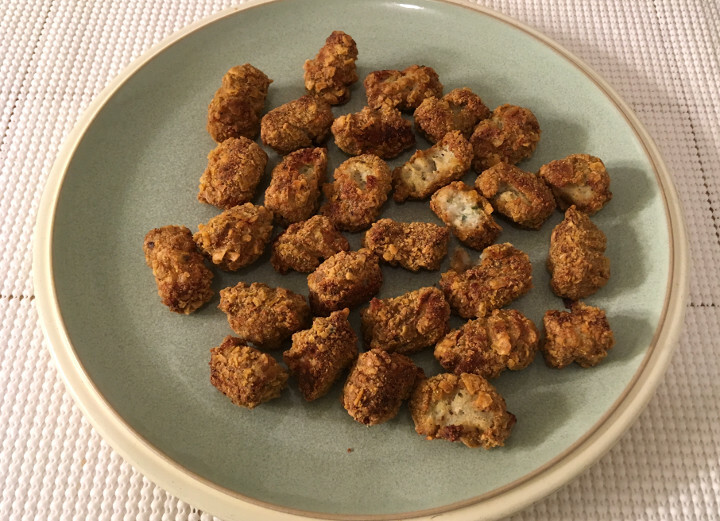 The instructions say to cook these on an ungreased pan specifically, but we should point out that the fish bites tend to stick to the pan. You might want to use some kind of cooking spray if you’re worried about sticky fish bites. These are made from wild Alaskan pollock, which means that they’re close in flavor to your typical fish sticks. The texture is pretty similar as well. The thing that gives these their distinct flavor, however, is the breading. It’s made from crushed tortilla chips. We did find ours to be a little too crispy and just slightly burnt tasting, but we suspect that’s a result of the overlong cook time. You could probably shave off a few minutes without the fish bites suffering — just keep in mind that these should hit an internal temperature of 165 degrees fahrenheit so they’re safe to eat. The breading also includes jalapeño peppers and chili powder. That sounds like it would make these a little bit spicy, but we didn’t notice any spice at all here. Spice-ophobes will rejoice, while fans of the spiciest food will be disappointed. So should you use a dipping sauce? We think you should for sure. 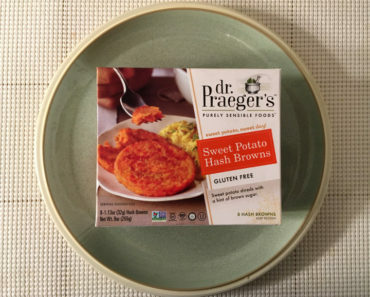 While we’re big fans of tarter sauce with our fish-based meals, these would actually go well with some salsa and a touch of sour cream. In fact, you might even be able to use these inside fish tacos. What a great idea! 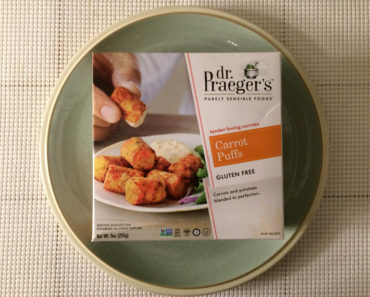 Nine fish bites are considered a single serving, and this package supposedly contains three servings. If you do that math, that comes out to about 27 fish bites per box. Ours had 29, depending on how you count. We had a few fish bites that were fused into bigger chunks, and we counted each mega-bite as two. If you count each of those as a single bite, then we actually did have 27 in our box. Anyway, a serving contains 170 calories and 340 mg of sodium, which isn’t bad at all. We decided to do some math to see how this would affect people who decide to eat more than a single serving at a time. 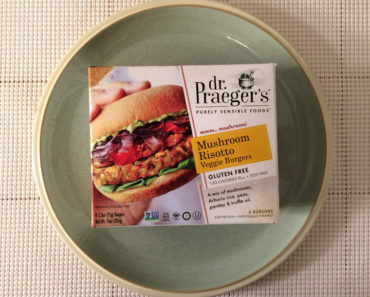 A full box contains 510 calories and 1,020 mg of sodium, so a half box contains 255 calories and 510 mg of sodium. With that in mind, a half box actually seems like a very good serving size rather than a third of a box. Of course, these are very small, and eating a full box in a sitting is certainly not outside the realm of possibility. 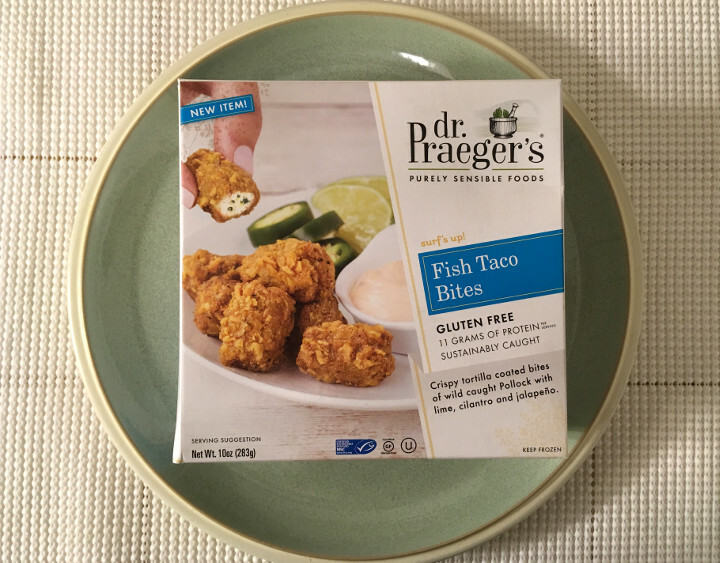 Dr. Praeger’s Fish Taco Bites are pretty tasty. Just don’t expect them to be spicy, and don’t overcook them! 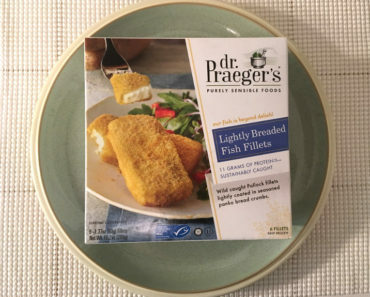 To learn more about the cooking instructions, nutrition content, or ingredients in these Dr. Praeger’s fish bites, check out our package scans below.